Melt 2 Tbsp. 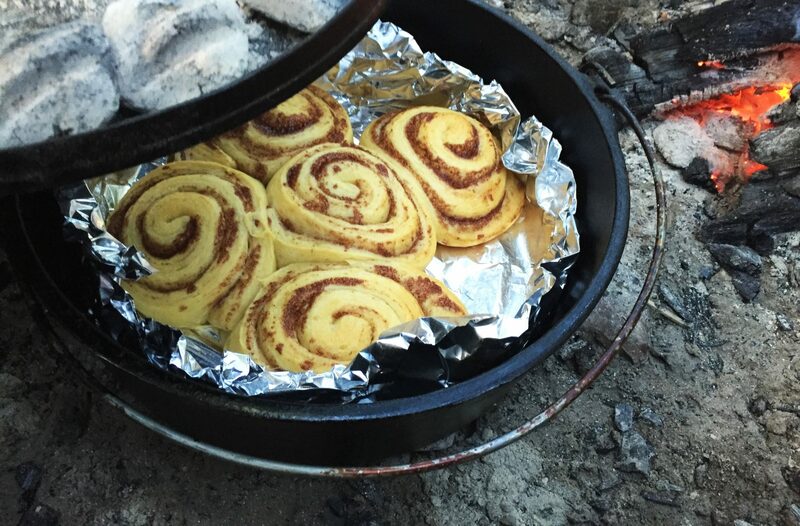 of the stick of butter in the bottom of the Dutch Oven. Whisk in the Corn Starch and heat until bubbly. Whisk in the 1/4 cup Pineapple juice and heat until thickened. Adjust corn starch until the butter juice mixture is like thick gravy. Add half the Cinnamon, Half the Brown sugar and a good shake of salt. Whisk in. Arrange the pineapple slices into the thicken mixture in the bottom of the Dutch Oven. Place a Cherry in the center hole of each pineapple slice. Dump the dry cake mix on top of the pineapple slices and spread evenly. Chop the remaining butter in chunks and distribute over the dry cake mix. Pour the the combined 8 ounces of liquid (Cider, Soda, Juice) over the entire top of the cake mix best you can. Sprinkle the remaining Cinnamon and brown sugar over the top. Cover the Dutch Oven with its lid. Coals for 350 degrees heat. With a 12 inch Dutch Oven with legs (or flat bottom raised on a trivet), place 9 coals on the bottom at the outer perimeter. Add a full ring of coals to the top at the very perimeter of the lid (about 15 -18 coals. Bake about 45 -60 minutes until a toothpick or knife comes out clean. 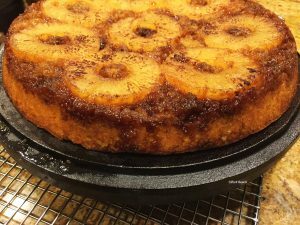 Once removed from the heat and cooled about 15 minutes the Dutch Oven can be quickly flipped and down hard on a paper plate, or the Dutch Oven lid to serve with the pineapple slices on top.